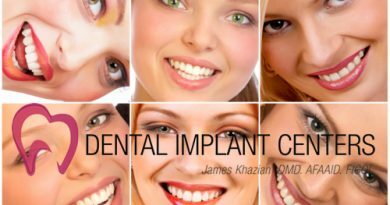 Dental Implant Centers is known for being the leading provider of comprehensive dental implant treatments in San Diego. We have provided the highest quality dental implant treatments in San Diego since 1990. From the replacement of a single missing tooth to extensive reconstruction and replacement of several or even all teeth, Dental Implant Centers offer the healthiest and most intelligent treatment solutions. We provide the most comprehensive treatments for dental implants in San Diego. Both surgical and restorative phases of your dental implant treatment are performed by Dr. Khazian. There will be no referral back and forth to another doctor or office. This means less confusion, and a more consistent, smoother, and faster dental implant treatment. Our offices are equipped with state of the art technology, and we use nothing but the best in materials and dental implant components. FULL MOUTH RECONSTRUCTION WITH DENTAL IMPLANTS.If most or all of your teeth are missing or failing, you may be a candidate for this treatment. You may also eliminate your old dentures, and have implant teeth that permanently stay in your mouth. Dental Implant Centers offers ‘Teeth in a day’ procedure, meaning as few as 4 implants are placed in each arch and restored with beautiful, strong teeth the same day. REPLACEMENT OF SEVERAL TEETH WITH DENTAL IMPLANTS. Each missing tooth may be replaced with one dental implant and a porcelain tooth (crown). It is also possible to have porcelain bridges supported by dental implants. For example: 3 missing teeth with 2 dental implants and a 3 tooth bridge, or 5 missing teeth with 3 dental implants and a 5 tooth bridge. REPLACEMENT OF SINGLE MISSING TEETH WITH DENTAL IMPLANTS. A dental implant is definitely your best option for replacing your single missing tooth. This is often done in one visit. That means the dental implant is placed and restored with a temporary tooth, all in one visit. This is called “Immediate Implant. BONE GRAFTS. Bone grafts are performed to rebuild severe conditions of bone loss and/or for esthetic considerations. Since dental implants are anchored in jaw bone, logically a sufficient amount of bone should be present for implant placement. Quite often, dental implant placement and a bone graft can be done in one visit. In other instances, a bone graft should be done and dental implant placement delayed for a few months. Dr. Khazian will evaluate your condition and recommend what works best for you. The goal of dental implant treatment is to achieve results which will last for decades, not just a few years. Dr. Khazian will plan your treatment with that goal in mind. Different types of bone graft materials and techniques are used to prepare an area of jaw bone for dental implant placement. Computer guided dental implant surgeries are used in Dental Implant Centers to perform more precise and less traumatic procedures. This computerized technology utilizes 3D scans to generate extremely accurate surgical guides to perform surgeries without incision, flaps, and sutures. A surgical guide is made, by feeding the 3D information of the jaw and surrounding structures into special software. From this a template is made that fits perfectly over the patient’s jaw bone and gums. Channels or tubes inside the template allow Dr. Khazian to do precise site preparation in the jaw bone for implant placement. GENERAL ANESTHESIA. Our experienced team of anesthesiologists provides this service to those who feel more comfortable to be under general anesthesia. However, most implant procedures are easily and quickly done under local anesthetic. In fact dental implant procedures are easier than most other dental procedures, and with less post-operative discomfort. Our patients are always amazed after surgery how easy it was. If you are having general anesthesia, you will need a driver to drive you to your appointment and back home. You will also need to observe fasting 12 hours before your appointment. SEDATION. Dental Implant Centers of San Diego offers this at no charge for those who are apprehensive. This will provide you with a state of comfort and relaxation. If you are having sedation, you will need a driver to drive you to your appointment and back home. IN-HO– — USE LABORATORY. Our modern in-house laboratory offers high quality, custom restorations, resulting in faster and better treatment to our patients. With an in-house lab, the adjustments and repairs can be done quickly and while you are in the office.